It makes us sad to hear of a dog being crated for so long, however, this picture made us so happy. You can actually see Milly’s smile as she is so obviously enjoying her new domain! You may or may not notice that Sara set the bottom rail lower on the vinyl picket fence than our installation guides suggest. This is perfectly fine as they did not want the dog to squeeze under the fence, so they put it low to the ground. 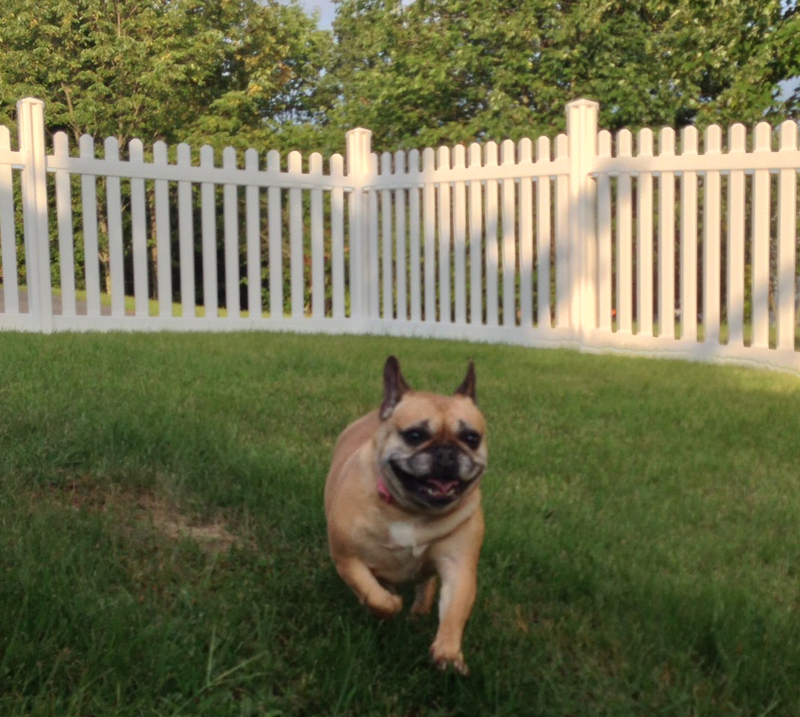 Millie loves her new freedom! Another picture we loved was the one below. Not only is it an absolutely beautiful backyard that makes us want to take a dip, but Patti obviously has a green thumb. What really made us smile, however was the uncanny way in which her dogs are posing almost perfectly. It’s like they are in a Sears portrait studio! How is it possible to get dogs to pose so perfectly?! How Do I Make a Fence Panel Fit into the End of my Fence Run? It’s rare when all your fence panels perfectly fit into the size of your yard. Fortunately, it’s very easy to cut the vinyl panels down to size. Since our panels are not pre-assembled, often this means you only need to cut the rail and bottom rail and then leave some of the pickets or tongue and groove boards out. Vinyl is a material that is very easy to work with, so any saw should do the trick. Our favorite is a circular saw. There are a few things you may want to consider, however, other than just cutting down that last panel to fit into your fence run. You’ll want to weigh your investment in time with the overall finished look. 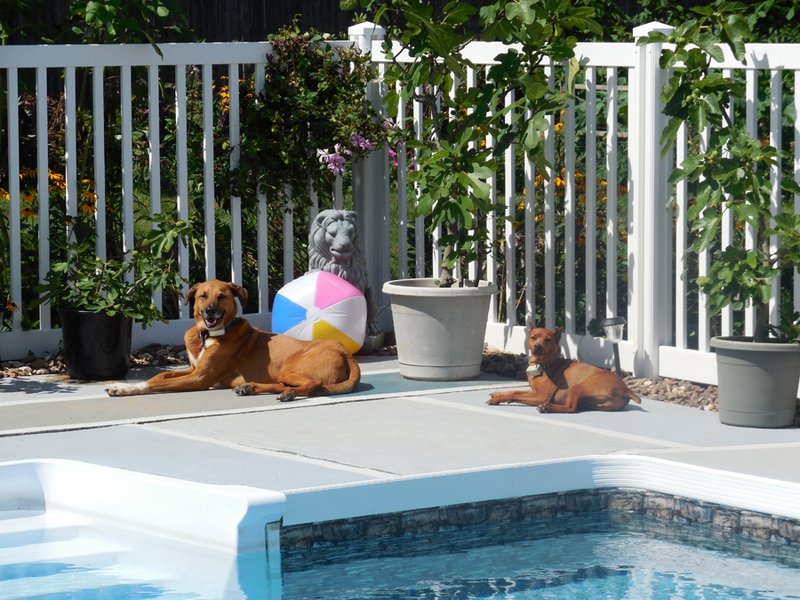 Below are three options you should consider when installing your vinyl or aluminum fence. A. You can equalize your fence panels for the most professionally installed look. That does result in the most amount of time, however, as each panel needs to be cut to the same size. We feel the end result is worth the extra time. B. You can equalize the first and the last section. This will ensure that the last panel won’t stand out and will give your fence run a more symmetrical look. C. Alternately, you can cut down just one panel at the end. While this requires the least amount of work and waste, it’s not how a professional would generally install a fence run.